It's Baselworld 2019 and while it might seem like it's geared towards large flashy watches from the likes of Rolex and TAG Heuer, there are also a number of well-designed, everyday watches on show. 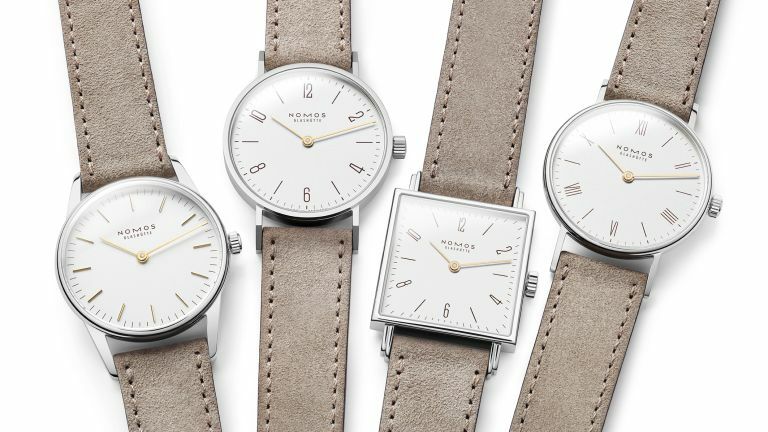 Take this beautiful collection from Nomos Glashütte for example, featuring four simple and elegant two-hand watches for smaller wrists. The "Duo" collection includes the Tangente, Orion, Ludwig, Tetra, four classic designs that Nomos Glashütte started with more than a quarter of a century ago. Now, the brand has introduced these new versions of these watches designed for "more delicate" wrists, with all models measuring 33mm in diameter (apart from the Tetra's side length, which is 27mm). The new versions have also been simplified, only featuring two hands (hence the name “duo"). All of these hand-wound watches contain a Glashütte "Alpha.2" caliber movement, meaning they are highly precise. All of the new watches are made of stainless steel, while the dials are white silver-plated. This silver case is complemented by golden hands, which gives the watches the appearance of jewellery. The watches are finished with mocha-brown typography (which is almost black, but softer), and the beige velour leather strap. A watch from the Duo collection would make perfect gift, and, as such, can be personalised by engraving the stainless steel back. The Tangente, Ludwig, Tetra and Orion Duo will be available from April at selected retailers, and look to be the most affordable Nomos watches yet.